impeller. 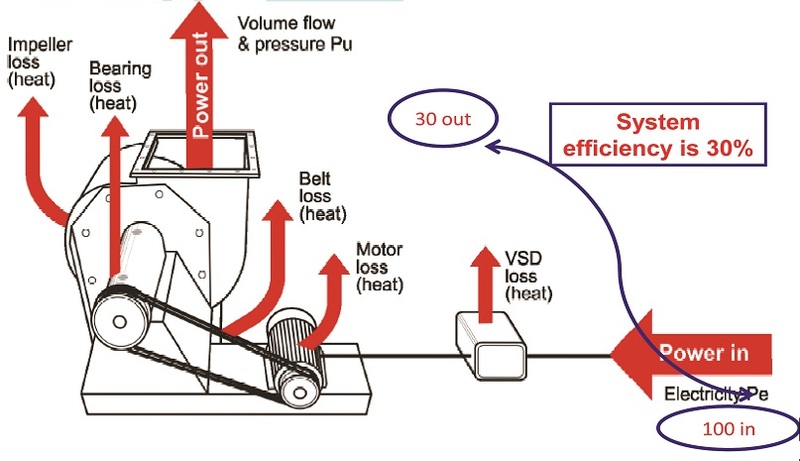 Hence, your blower system which consumes at the input as 100 units, delivers only 30 units at the output. The blowers are used in various applications in the industry like the air handling units, air washers, dust collection system, waste evacuation system, material handling / transport systems etc. The above applications call for the basic two parameters, the deliverable air / gas flow at what static pressure. 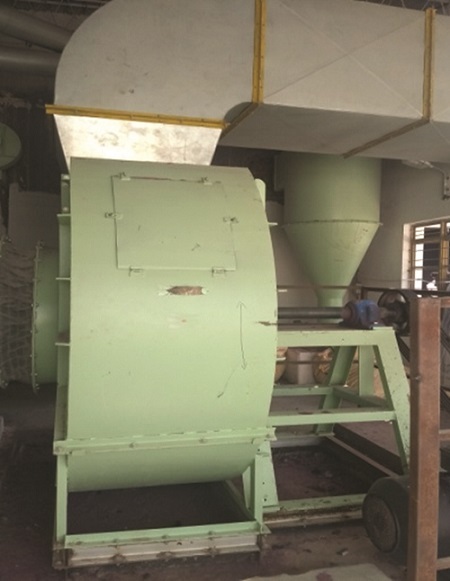 This paper elaborates on the efficiency in per cent in each of the sub system so as to achieve reduction in their self-consumption energy loss and hence improve the overall blower system efficiency. I image – Around 30 % only is the deliverable AHU output, as sub systems are energy in-efficient. II image – AHU name plate spec and study the specs and to assess the loss between the cup & the lip. Existing fan delivers here, output as 60 % of input only due to Cup & Lip Energy losses in between. All the sub-systems can be improved upon to reduce the energy losses by half from now on. also was prohibiting the impeller profile & efficiency. Impeller with aluminum MOC is changed now to the airfoil profile with less weight M S sheet MOC and this yielded higher efficiency due to Impeller profile change. 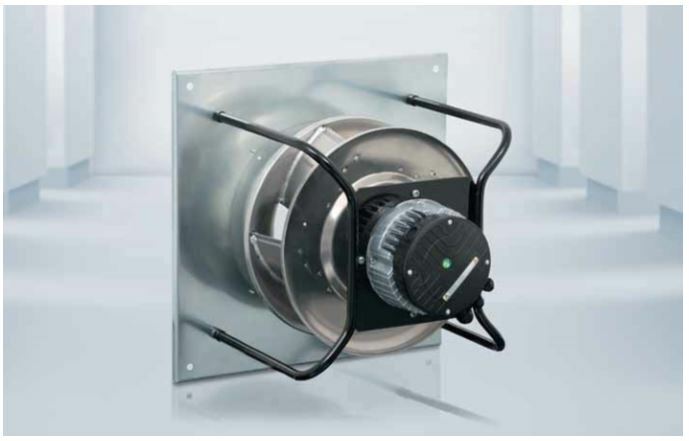 – Old timer OEM contentedly designed the impeller with backward inclined flat profile and later the fan OEM changed over to backward curved profile to air foil profile. This air foil type suits to clean air applications and environments. – The centrifugal backward curved fans generally have a non-overloading power characteristic; the backwardinclined blades are flat and have constant thickness. Backward-curved blades are slightly curved. Air foil blades are generally formed from hollow sheet metal to meet the shape. – So, as per BEE’s table, the existing fan blades are having efficiency from 72 to 79 % band to 79 to 83 per cent band depending on the profile designed by the OEM as modified radial blade design to inclined flat to curved design, that is more near to airfoil design, delivering highest efficiency. – The modified radial blades are radial to the fan shaft at the outer end of the impeller, but gradually slope towards the direction of wheel rotation. They are more efficient than the radial blade but less than backward inclined profile. 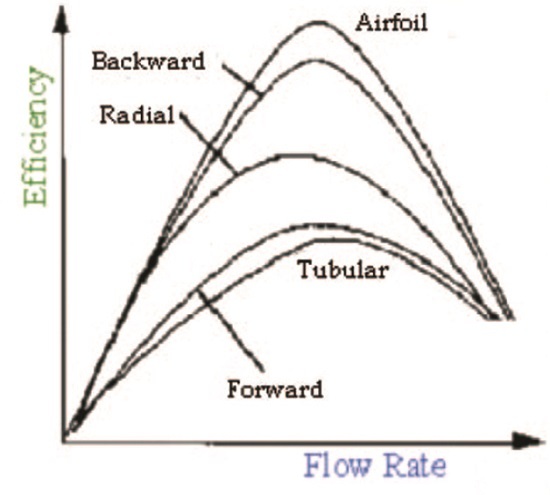 – The efficiency versus flow curve of the above fans indicates that the best operating point or the peak efficiency point is achieved in narrow band only and is not a wide band characteristic. – Today re-visit to your industry’s running fan and confirm that you are using the highest / high / moderate efficiency fan. Because that was bought few years back, based on its initial costing. – In your waste suction blower, take steps to expand the blower outlet duct as your existing blower is wasting its static pressure by way of higher back pressure, curbing its system efficiency. Courtesy: Bureau of Energy Efficiency Guide books, Fans & Blowers chapter. Courtesy : Peak Efficiency Pt. of Centrifugal Backward Fans & Blowers by Prof H Q Nagpurwala. Since the VFD is fitted to your blower, we have to take into account, the self loss of the VFD as 2 %. So, it is always preferred to operate your VFD in part loading say between 30 to 80 % band and not in full loading and above as 90 to 120 % band etc. You are using the VFD to match your blower design parameters to the process parameters like temperature, pressure, RH, etc. Some industries are using VFD to the blower for the purpose of variable pulley function only and routinely manually set VFD Hz settings to match process flow. Your VFD can be put to full use only if the VFD controls automatically the blower RPM to suit to process flow by way of closed loop function and the sensor say like temperature, RH, static pressure in case of Air Handling Units (AHU), Air Washer utility. For material handling function of powders etc, static pressure is the key parameter to be controlled and sensor is chosen rightly. – If your belts are actively gripping the pulley, then you are maximizing your belt transmission efficiency. If your belts are only passively touching the pulley, then your belts & pulley consume more power and less belt transmission efficiency now. – The industry must visualize today, the visible loss in their belts and pulleys. If you change your V belt today to raw edged cogged REC belt, this transmits power without loss, compared to the V belt to deliver near the rated Revolutions per Minute (RPM) and hence, it gives you more productivity. Simultaneously, if you optimize the ‘motor & load’s pulley size to suit to the same output as load RPM, then it is power saving for you. 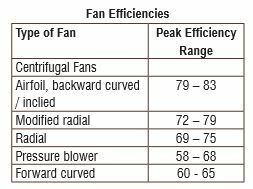 – This comparison table of same type of centrifugal backward curved fans is informative and you the buyer have to use this table in your new buy or existing fan to assess its system efficiency. – So, focus on belt & pulley change today (and not only the belts only as a routine change), and anticipate more productivity at less power consumption. 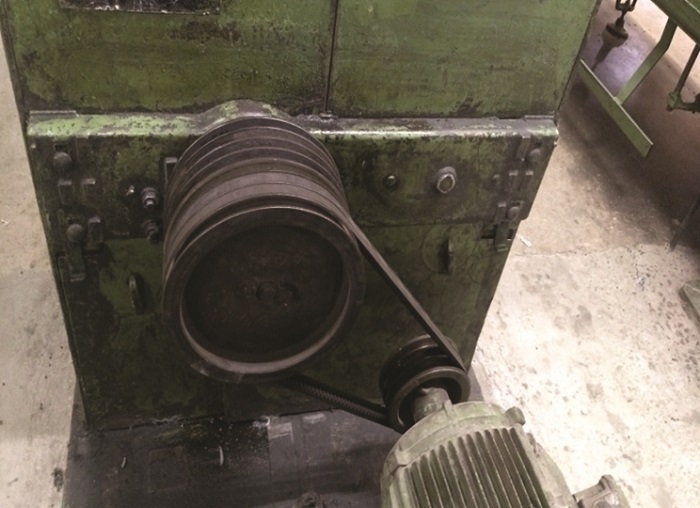 When the belt numbers are halved, physically down-size the pulley grooves say from 4 to 2 grooves thereby, power saving is achieved here by material conservation. – Universally, the rotating components either active / passive, need to have less weight only. Excess rotating mass consumes more energy only and that is not useful to the motor-to-machine power transmission. Direct coupling also will solve the above problems, but this as well has its inherent slight drawbacks. Normally, OEM uses belt as weak link of transmission when their sturdy machine and motor are linked, and each of them not to mismatch each, even instantly also. 2 grooved Motor pulley weighs 5 Kg linked by 2 belts in 8 grooved m/c pulley weighs 20 Kg. This excess weight of machine / motor pulley will consume more KW. 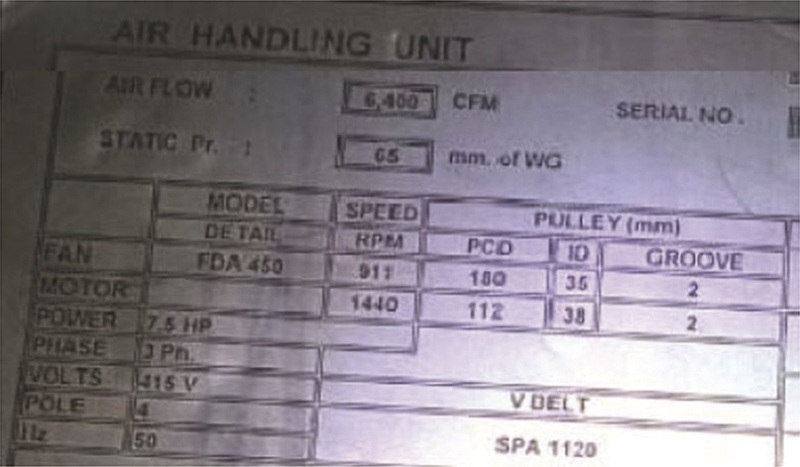 Match belt & groove numbers. 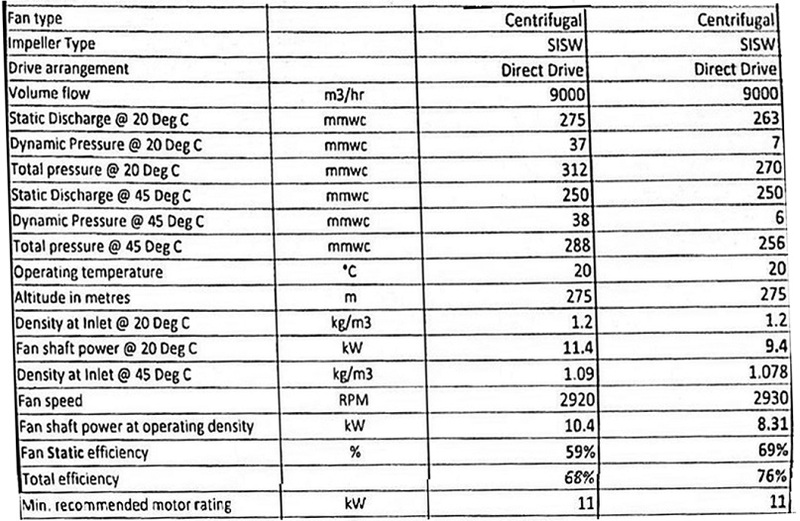 Centrifugal backward curved fans efficiency comparison will indicate the Total Owning cost Fan Total Efficiency = Volume in m3/ sec X Total pressure in mmWC / 102 x Power input to Shaft KW Calculate above two fans’ efficiency as 68 % and 76 % and use this formula to know about your fans. – We still have decades-old multiple times-rewound (count-less rewinding) motors running hotter at normal loading, overloading, repeated greasing with conventional grease over & above the existing grease not allowing to drain out the old worn-out grease, DE & NDE bearing ends show temperature difference of say, more than 20 Degree C displayed by the portable thermal imager. – Monitor your motor with power & energy metering and target the above causes of hotter motor. And after trying all the above zero and low cost measures on the motor, it is time to wake up to switch over to IE 3 motor now. Be aware that the IE 3 motors growth is likely to double in 2019 with reference to 2014 in the world industry. And that IE 1 motor’s growth is getting halved now. In India, it is already in the Gazette to change to minimum IE 2 motors from 2018 onwards. 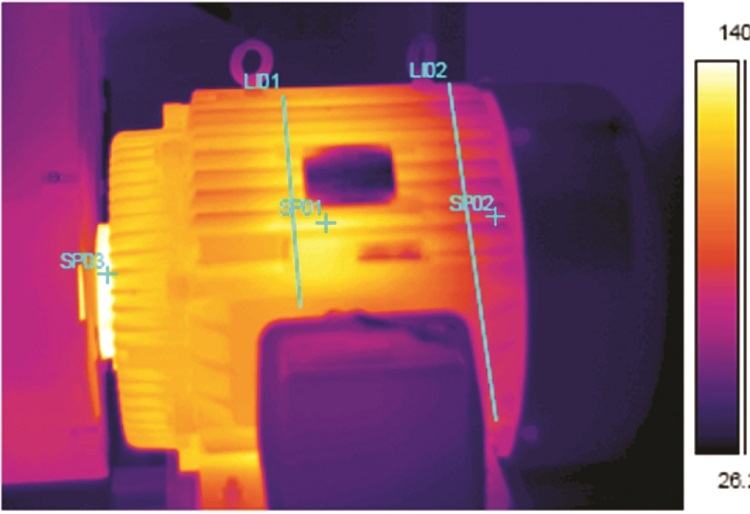 – Routinely use your thermal imager to assess your motor & machine health. Spot out the hot spot in motor and try ways to reduce the heat. Hotter motor is due to overloading, current unbalance, sticky or over-greased bearings, (many industries have switched over to specialty grease as Polyurea thickened Lithium complex compound now), poor lubrication & starved ventilation, alignment problems, repeated re-windings, lower than rated volts, hotter windings due to VFD input to your standard conventional motor. Waste collection Suction centrifugal blower rating 55 KW, 75000 CFM flow @ 2200 Pascal. 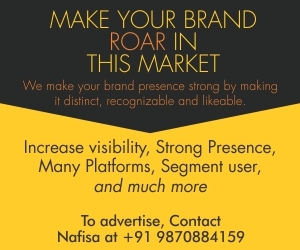 In your industry, give a macro view to your existing fan as a system. Study whether you can retrofit, replace the sub system components to reduce the overall energy loss by 10 per cent conservatively, by low to medium cost energy conservation measures. The above is in line with energy conservation route in the existing centrifugal backward fan system. Also look into your process requirements and plan for energy efficiency option route by changing the total system to electronically commutated EC Multiple BLDC fans to achieve more than 50 % energy savings as a total system change. This is similar to the exercise of replacing our CFL / FTL to the LED tube lights, as energy efficiency route. If you see the total owning cost of the fan for its life say 10 years, EE route is always better than the ECON route, barring the initial huge costs involved.